Tolle Aussicht, Abgeschiedenheit 5 Minuten zu Fuß zum LAKE MI, Dish, WiFi # 1 Strand USAToday. Pere Marquette Beach wurde von USA Today zum besten Strand in Michigan gewählt. Komm, besuche Muskegon !!!! Das Bluff House liegt auf einer Düne mit Blick auf die Bluffton Bay und den Muskegon Lake auf einer Halbinsel zwischen dem Muskegon Lake und dem Lake Michigan. Die Gegend von Bluffton hat eine faszinierende Geschichte und ist ein sicherer und freundlicher Ort zum Verweilen. Es ist ein Ort zum Entspannen und genießen Sie die Schönheit des Muskegon Lake und Lake Michigan und die umliegenden Dünen und Wälder. Man kann ihre kreativen Säfte fließen lassen oder die Arbeit von mehreren ansässigen Künstlern in lokalen Galerien in Lakeside und Muskegon genießen. Der Blick vom Bluff House ist der beste Punkt - 180-Grad-Blick auf Bluffton Bay und Muskegon Lake. Es gibt eine große Terrasse in der Front und eine kleine abgeschirmte Terrasse auf der Rückseite. Sie können im Wohnzimmer sitzen und den Blick auf den See genießen oder die umliegenden Bäume und Sträucher auf der Rückseite genießen. Es ist eine sehr abgelegene Umgebung, aber es ist immer noch in der Stadt mit all den Aktivitäten, die ein Stadtgebiet mit sich bringt. Der Muskegon Yacht Club befindet sich direkt gegenüber und die Skipper suchen immer mittwochabends nach Crew. Es gibt eine Vielzahl von Möglichkeiten, um das Bluff House zu erreichen. Man kann mit dem Auto anreisen, indem man die Autobahnen einige Kilometer entfernt nutzt. Es gibt auch die Cross Lake Fähre, die drei Fahrten pro Tag zwischen Muskegon und Milwaukee nur ein paar Meilen die Straße hinunter hat. Man kann mit dem Fahrrad zur Fähre fahren, einen Tag in Milwaukee verbringen und mit der Fähre zurückfahren und ihre Fahrräder zum The Bluff House bringen. Das Bluff House befindet sich 3 km von der Fähre und 20 Minuten von Michigan Adventure entfernt. Es gibt viele schöne Fahrradwege entlang Lake Michigan und Muskegon Lake entlang der Dünen und durch Feuchtgebiete. 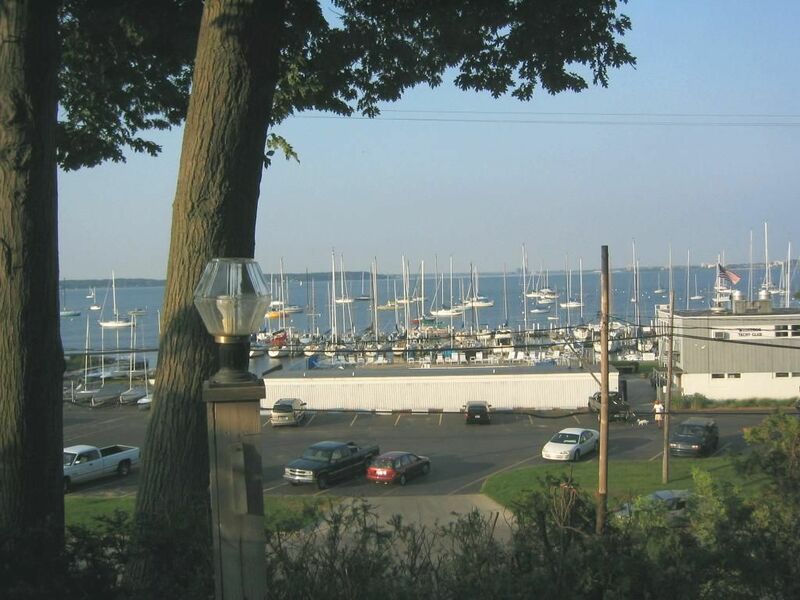 Wenn Sie Mitglied eines anderen Yachtclubs sind, können Sie mit dem Boot anreisen, im Muskegon Yacht Club anlegen und die Einrichtungen wie die Bar, das Restaurant und den Pool nutzen. Ihr Boot wird vom Deck des Bluff House aus sichtbar sein. Sonnenaufgänge sind eine Spezialität im The Bluff House. Genießen Sie Ihren Kaffee oder Frühstück auf der Terrasse beobachten einen spektakulären Sonnenaufgang ist wirklich der beste Weg, um den Tag zu beginnen. Es gibt einige umfangreiche rosa Himmel, um Ihre visuellen Sinne stimulieren. Sonnenuntergänge - sind Sie auf eigene Faust. Allerdings ist es nur eine halbe Meile in unseren schönen Sand Lake Michigan Strände. Ein kurzer Spaziergang, mit dem Fahrrad, oder mit dem Auto zu einem schönen Erlebnis. Unsere Strände, Pause Wände und Leuchttürmen wird Ihnen den Atem rauben. Fischerei vor der Mole ist erlaubt. Segeln und Schwimmunterricht sind an der Muskegon Yacht Club zur Verfügung über die Straße. Es gibt auch Skipper gechartert Segelfahrten gegen Gebühr zur Verfügung. Muskegon Yacht Club bietet Segel- und Schwimmkurse für Kinder. Bitte überprüfen Sie mit dem Verein für Details an 231-755-1414. Um Ihren Genuss zu erhöhen, haben wir DirectTV HDTV auf über 500 Kanäle mit Sport oder Filme anzusehen. Sie müssen Ihr Auto in die Garage fahren, die Treppe zum Bluff House vermeiden. We refused to stay at this property as the owner states it will accommodate 8 people but there were 3 couples and not one of us was willing to stay in the "bedroom" off his garage with no LEGAL EGRESS to the outside of the house. We spoke directly to the owner about this issue and he suggested one of the couples stay in the living room on the futon. None were happy with this solution. We asked for a return of our payment and he left saying he would discuss with his wife and did not return. We left after about 20 minutes. We have disputed the charges with my credit card company and will see where that gets us. If we don't find a successful resolution with this property owner we will have to contact Muskegon authorities about his "bedroom" which leaves no window to access the outside of the building in an emergency. There is a window in the room that leads to a hallway to the garage. This will not pass building code requirements anywhere in the US. VRBO has left this between us and the property owner to resolve. This issue should be enough to turn most away if they need a room for 6 or more people. Response: The house accommodates 6 people upstairs and in case there is need to add additional people, to facilitate customers need for vacation, we added additional bed downstairs. The customer in this situation changed her story. Her original complaint was there is no emergency exit. There is entry door to the house downstairs right by the bedroom and the door to the garage and garage door is next to it. Response: The customer left without getting back to me. I kept calling without any response. The phone record is available. Response: The customer tried to cancel the reservation within the 60-day window as signed by customer on the contract. I was surprised that the customer claimed they do not acknowledge the charge on credit card. We had to go thru the dispute process with HomeAway and the charge was cleared for the Bluff House. The place is exactly as advertised on this site. Could definitely use some updating but was a nice place to spend the weekend with friends!! Thank you so much for taking the time to give us the review. As you stated, the house is exactly as advertised. We like the old beautiful charm. I am personally have appreciation for it. We had a great time! Wonderful view onto Muskegon Lake from the front porch, living room, and kitchen. Loved having a dishwasher, laundry machine, and dryer. The grill also worked great. My husband and older kids enjoyed using the bikes. The owner, Sid, lives next door, responds to texting very timely, and is super helpful. The driveway is steep, but you can park in front of Sid's house, directly at the bottom of the driveway or immediately on the other side of the street. There are steps for going up and down, and my family actually enjoyed the bit of exercise. Would definitely stay here again! Thank you so much for taking the time to give us review. My wife and I are very happy you enjoyed your stay. We hope to see you again. The house was adequate for our needs. The view of the marina was good; the driveway is quite the joke. Good exercise, I guess. The house should be advertised as holding only 4 adults and needs quite a bit of remodeling work to update the electrical system. We bought the house a new toaster as the old one only heated with the outside elements. There was no dining room table for the 6 of us to gather around, or entertain family that showed up. We used a card table from downstairs, and the kitchen table held 4 individuals, so 2 of us sat sideways on chairs. We are grateful that the weather was perfect so we could have folks eat outside a lot. The grill and the air-conditioning worked well. Issue: The view of the marina was good; the driveway is quite the joke Good exercise, I guess. The house should be advertised as holding only 4 adults and needs quite a bit of remodeling work to update the electrical system. Response: the information about the house is clearly listed with pictures. We never recommend the house for anybody who can not handle the steps. All information is on Homeaway website. The electrical system is 24 volt touch button system and works fine. You are the first guest that complained about that. I wish you communicated to us. We live next door as I told you and we welcome any question or concern. The house can handle 6 people easily. Again, the picture on the website shows clearly what the house look like. Issue:We bought the house a new toaster as the old one only heated with the outside elements. Response: we have replacement equipment for items like that. Again, you did not communicated to us and my cleaning ladies don’t check the equipment if they work or not. We will start have them do that. Issue: There was no dining room table for the 6 of us to gather around, or entertain family that showed up. We used a card table from downstairs, and the kitchen table held 4 individuals, so 2 of us sat sideways on chairs. Response: the table has two leaves and it can be expanded. It is big enough for 6 people and it has 6 chairs. Issue: We are grateful that the weather was perfect so we could have folks eat outside a lot. The grill and the air-conditioning worked well. Response: I am glad to hear you enjoyed the outside area. Nice view and good location. Nice house. Very conveniently located, but I must say that the walk to the beach is 15-20 and not 5 minutes. We also have not got our deposit back yet, even though as per my knowledge, we have not broken anything and left the house clean. Comfortable home, gorgeous view, friendly and responsive owner. We were looking for a few days of relaxation, and found it at Bluff House. Plenty of space for our family of four with grown children. Close to everything we wanted to do. The bikes for guests to use are a really nice touch. Wish we would have had time to use the kayaks too! The owners live right next door, and were responsive to anything we needed. Sid gave us some great recommendations for things to do and restaurants. Would definitely recommend or visit again! My wife and I thank you so much and we appreciate your business. You were wonderful guest. Sonstige Aktivitäten: Gratis WLAN-Zugang und Direct TV. The price does not include cleaning fee or refundable security deposit. A signed contract is required. The house is on Bluff and it has 2 bedrooms and 2 bathrooms with third bed available for sleeping two people in lower level of the house- please see pictures and call if you need help.